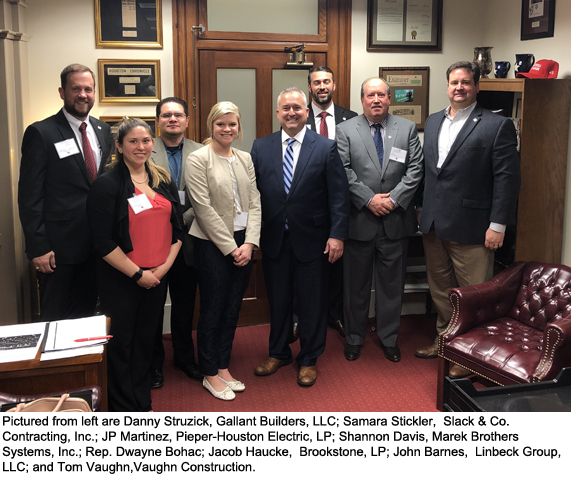 When 44 Associated General Contractors (AGC) Houston members representing 23 companies travelled to Austin for the AGC/Texas Building Branch (TBB) Legislative Day on February 25, 2019, the mission was simple: to meet with and ask key legislators for their support on a handful of bills important to the commercial construction industry. By March 8 - the deadline for filing bills - the handful of bills AGC supports became part of more than 7,000 bills to be debated, negotiated, amended, debated, tweaked etc. and hopefully, deemed worthy of passage. HB 1737 (Rep. Justin Holland) – Shortens the time period for suing for design/construction defects (“statute of repose”) from 10 years to four years for patent (i.e., visible, obvious) defects and from 10 years to eight years for latent (i.e., hidden) defects. Representatives of the Houston contingent included members of the chapter Board of Directors, the Government Affairs Committee and the 2018-2019 Leadership AGC Class. 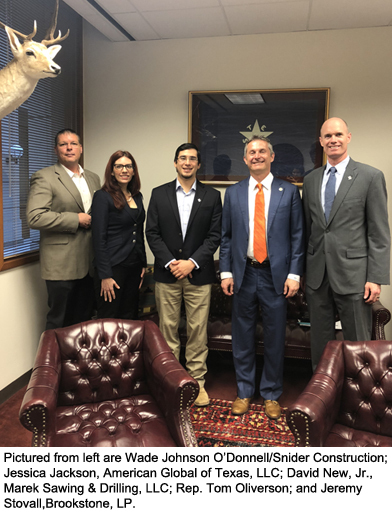 Less than three weeks after Legislative Day, several AGC members were back in Austin to testify before the House Judiciary & Civil Jurisprudence Committee. On March 11, all three of the aforementioned bills were heard before the committee led by Chair Jeff Leach. The hearing was an opportunity to get bills heard, get positions on record, and present the story from a construction industry perspective. In addition to TBB President Corbin Van Arsdale, representatives from AGC members Vaughn Construction, Sedalco, Inc., Cokinos | Young, Cadence McShane Construction and Bartlett-Cocke General Contractors all spoke in support of the bills. Several additional members signed the witness form “FOR” the bills without presenting testimony. Driving the need for the passage of these bills is the growing “cottage industry” of contingency lawsuits, mostly targeting the independent school districts. Passage of these bills would still allow for lawsuits to be filed related to construction defects, but they would also ensure that they are done in a timely manner, that settlements are spent on repairs and that contractors would have the opportunity to repair or cure the problem before being sued. Sine Die, the last day of the session, is May 29, 2019. With two and a half months left in the session, it is certain that there will be several twists and turns as the TBB legislative team works the bills through the legislature. It is important that if given the opportunity, that AGC Houston members and construction industry-related businesses be prepared to support those efforts in every way possible.